US military officials say they are preparing for a full scale invasion of Gaza against people armed with kites and rocks. This week, the Israeli Army was given orders to prepare for a “large-scale military operation” of the Gaza Strip, which would include an invasion of the region. These orders come just a day after Israeli army warplanes attacked the Gaza Strip. Israeli officials are justifying their actions by citing small attacks that were recently blamed on Hamas. This type of rhetoric is typical from the Israeli government, they attempt to play the victim by claiming that they are retaliating against Hamas, to justify attacking innocent and defenseless Palestinians. “We are in the midst of a campaign, there’s an exchange of blows and I can tell you the Israel Defense Forces are ready for any scenario,” Netanyahu said in an interview, according to Haaretz. As the Times of Israel reports, on Sunday, the IDF’s 162nd Armored Division launched an exercise simulating a war in the Gaza Strip, including the capture of Gaza City. While the military said it was planned in advance and was not related to the weekend’s exchange of fire, the manner in which the exercise was publicized by the military led many to see it as a tacit threat to Hamas. 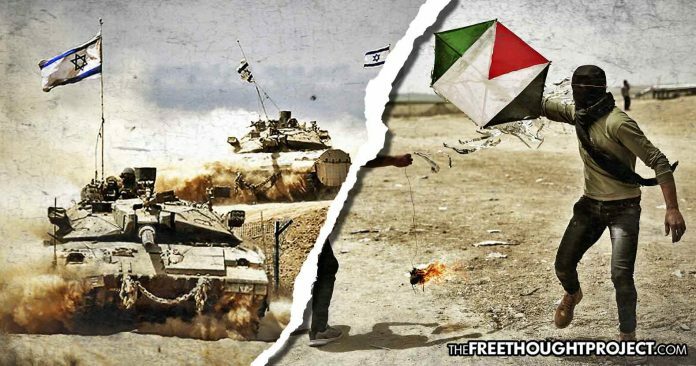 Israeli officials said that if the launching of flaming kites doesn’t stop, the invasion would go on. However, according to a report cited by the Times of Israel, the report said Hamas would only put a complete stop to the flaming kite launches if it can achieve some sort of accomplishment, such as the reopening of the Rafah border crossing with Egypt. When the state of Israel was created, instead of integrating the Arab and Jewish cultures together, the ruling class put policies in place that would force the Palestinian people onto infertile ghettos, separated from water sources and food-growing lands by giant walls. The Palestinians were also not given the right to organize, own property, or work, and without these basic freedoms, they remain refugees on their own land. These policies would result in a growing hostility between the two groups which eventually flared up in physical violence. This violence has spread all throughout the oil-rich Middle East and has allowed the western establishment to have a permanent involvement in the region’s affairs. MPs Ahmed Tibi and Ayeda Touma-Souliman from The Joint List, a coalition of Arab-dominated parties in the Israeli Parliament, shouted “You passed an apartheid law, a racist law,” at Netanyahu as he gave a speech praising the new measure. Reports from the Health Ministry in Gaza claimed that several of the 41 Palestinians killed on Monday were teenagers, and as many as 1,700 civilians are now left suffering from injuries after Israeli Defense Forces opened fire on protests near Israel’s border fence. This comes in addition to the dozens of Palestinians who have been killed and the thousands who have been wounded by Israeli sniper fire in recent months. While Israel has falsely claimed that every man or teenage boy who participated in the protests was a “militant” for Hamas, and deserved to die, there was one civilian death that was particularly notable. While Israel has justified the killings by claiming that their soldiers opened fire because the suspects “attempted to infiltrate” the Israel-Gaza border, a disturbing video was leaked last month that showed multiple Israeli men celebrating after a sniper targeted and shot a non-threatening man who was standing in a field on the other side of their border fence. To prevent evidence like this from reaching the surface the Israeli government is reportedly targeting journalists and human rights group with a newly proposed bill that would outlaw the filming of Israeli troops, which critics are calling an obvious attempt to hide war crimes that are regularly committed by the country’s military. “Israeli soldiers are under constant attack by Israel haters and supporters of terrorism who look constantly to degrade and sully them. We will put an end to this,” Lieberman said. Deputy Palestinian Information Minister Fayez Abu Aitta pointed out that this is an obvious attempt to cover up the Israeli government’s own terrorism and war crimes. “This decision aims to cover up crimes committed by Israeli soldiers against our people, and to free their hands to commit more crimes,” Aitta told Reuters. In recent years, as the horror that the Israeli government unleashes upon the prisoners of Palestine has been exposed, global public opinion is finally beginning to shift against the apartheid state. In response, the governments in the U.S. and Israel have both been forcing legislation to keep a lid on the genocide that is taking place.